Nothing beats fresh basil and nothing beats not having to pay $2.99 in January for fresh basil. So technically I guess fresh is subjective, but this method is a great way to preserve basil now for use up to 6 months later in your fridge. So yes, my basil bolted and was starting to droop, turn yellow, and was basically dying — a sad seasonal cycle called the end of summer. Cutting the organic basil grown from seed, I trimmed the lower half off until I was left with mostly beautiful big green leaves of basil. I then rinsed the stalks and gave them a good shake to remove the heaviness of the water and put them on the back deck railing to dry completely (about 2 hours). 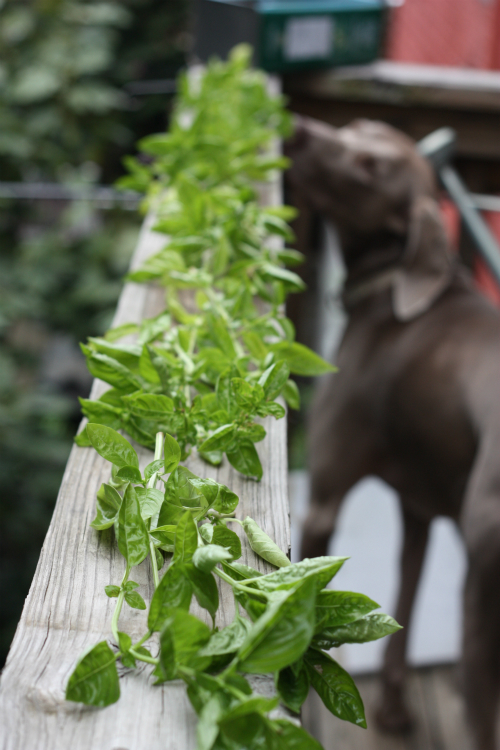 Note my dog (2 year old Weim aptly named Basil) smelling the basil. Also note in the way back distance my olive oil can planter which has a new round of mesclun greens growing to enjoy in early fall! It really becomes a layering process at this point. 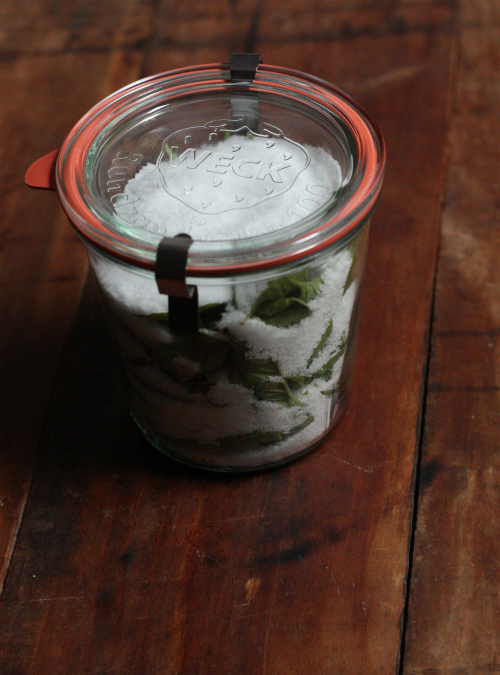 Using a WECK canning jar I layered the bottom with 1/4" of kosher salt and began layering the leaves, covering each layer with another layer of salt. Once finished, you seal the jar and place it in the fridge. The basil should keep for up to 6 months. 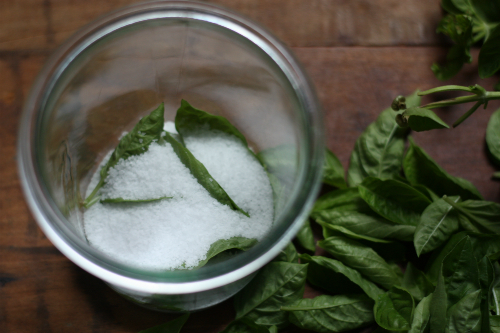 Salt has been used as a means to preserve food for years and this is one French way or technique of preserving basil to this day. Here in Richmond, Virginia we are lucky in the fact that most thyme, rosemary, and some hearty oregano does make it through the dead of winter. It is nice to know I can enjoy some of my fresh basil right up until I can start planting it fresh again in the spring. How about you — have you had success bringing some herbs indoors? Any other tried and true methods? Do tell! Never seen this before but what a great idea! Here I cannot get fresh basil at all during the winter so I am going to buy a huge bunch of basil at Saturday's farmers market and go to work. Well a first time for me and in 5 days mine looks good turning a darker green but understand the smell and flavor stays just like fresh basil! Let me know how it goes! Thank you! I was just outside picking basil for my pizza and I was thinking of how sad it was going to be for all those gorgeous leaves to go to waste. Not now! I felt the same way! It is my first go at this technique (see previous comment) and I am looking forward to successful results cooking with this in say January! Now Monica let's talk about that pizza I am hungry now! Yum! It was a darn good pizza! I made some gluten free dough (from a box) and I really enjoyed it. Your basil might make a come back at this point if you left if in the pot. My basil did not do well this summer - not enough water and I'm convinced that no matter how much it loves hot, it was too darn hot for mine. I've hacked it back and it's producing again, so I'm hoping for a last harvest. (Fingers crossed). Meanwhile, I have a few kind, generous friends who have shared some of their basil with me, so I've gotten some pesto batches in the freezer. I hope it makes one more run! I hope it does well for you Jasanna! my giant basil plant has already given me 6 pints of frozen pesto and now when I have to cut it before the first frost I am doing this with the rest! Great Shelley good luck and thanks for stopping by! I have a question: preserving them in salt...doesn't that add a salt flavor to them? Or are they able to keep their flavor? This is curious. 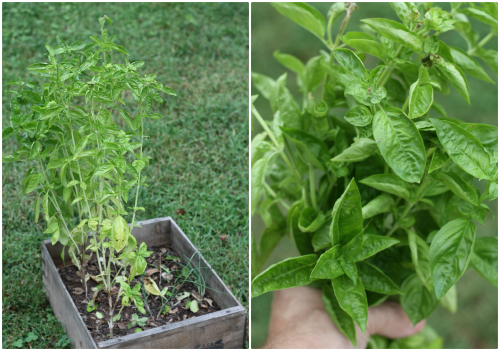 I'm not too much of a basil fan but I wonder if you could do the same with other herbs? I mean, as long as the pieces were big enough that you could find them again, lol. Very interesting. Megan really the first time I have attempted this. From what I have tried I rinsed the leaves before using and tasted a hint of salt and did get the aroma of fresh basil. 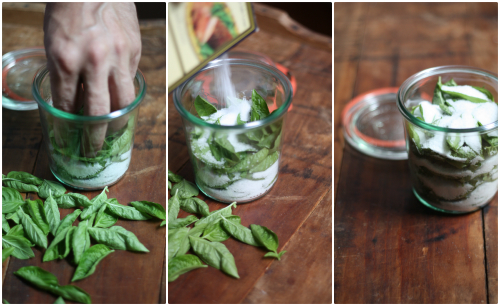 Also, the salt can be used later as the basil does not affect it! Thanks for stopping by! Absolutely use a mason jar. 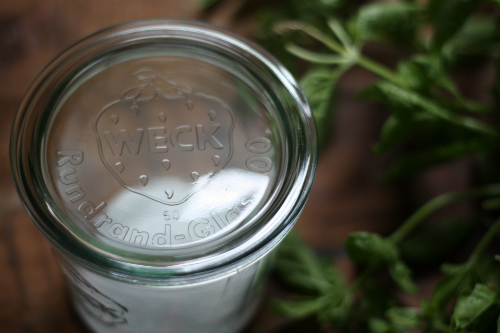 I am just kind of fond of my weck jar and it worked for the photographs in this post! Thanks for stopping by! 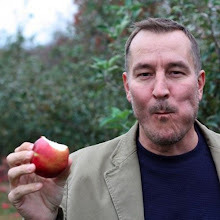 Tim or the other readers - Have you been eating your basil? I tried this technique. The flavor of the basil is good, but I can't get enough of the salt off of it, and the salt is overwhelming my food. Anyone else having the same experience? Have you found anything to help? Thanks! Hi everyone - My mother used to put all her basil in a blender and chop finely and then add a tiny bit of water and freeze as small icecubes to use later in many recipes you need the flavor but not the leave-form. She would do the same with mint, perfect for later winter-Mojitos here in the North hemisphere. I thought I might share. I do this every year with my basil. I just layer with salt, whatever kind is handy, in a square high side baking pan, or whatever container is handy. I then cover with plastic wrap. 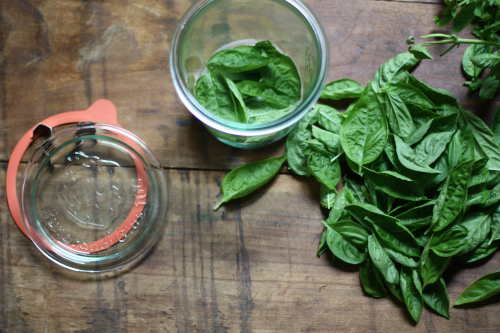 When the basil is thoroughly cured after a week or so, I then take the basil out and shake off the excess salt, not too aggressively, there is still some salt clinging to it, and stuff the leaves into a canning jar and use a pump-and-seal to vacuum pack it. IT then get's stored in the pantry. The leaves are leathery and supple like cured cigar tobacco. They are salty and a recipe needs to be adjusted for the salt. All the basil flavor remains. I never refrigerate them (basil hates the cold) and the leaves last for years, not months, with no degradation in flavor. Thank you great idea! Does this work for other herbs? Parsley, etc. ?